GNOME Files (or Nautilus) has a batch file rename feature (introduced in version 3.22) which allows finding and replacing text in multiple filenames, as well as adding automatic numbers, or renaming files based on metadata. While not very advanced, this features makes for a great tool when you want a quick way of renaming multiple files on Gnome desktop. 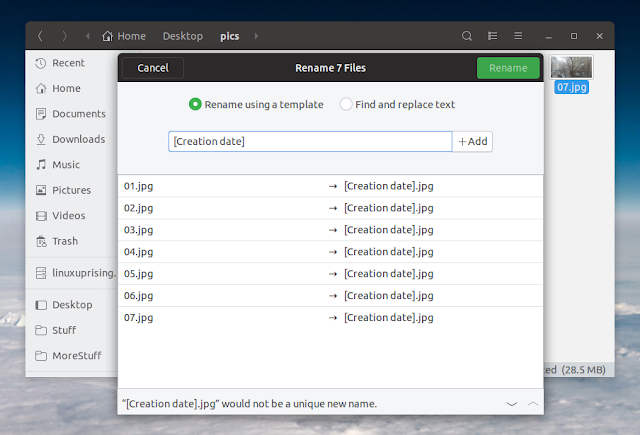 You can use the Files app (Nautilus) batch rename features by selecting multiple files, right clicking them and selecting "Rename" from the context menu. 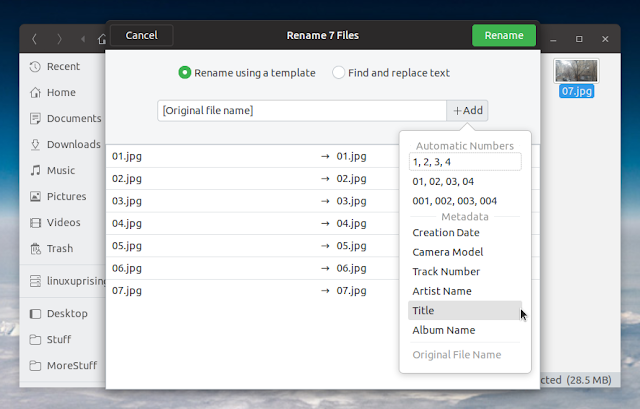 The metadata-based batch file renaming includes support for renaming images based on their creation date and camera model, and music based on tags like the artist name, title, or track number. 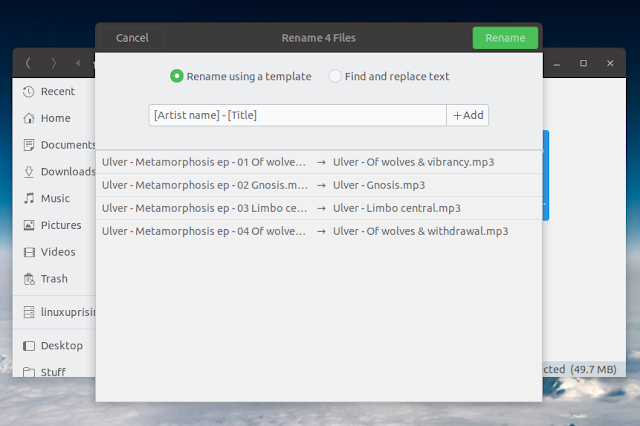 Batch file renaming based on image and music metadata doesn't work by default in Ubuntu though, inserting only the metadata name instead of the actual metadata. The reason for this is that Tracker is not installed by default in Ubuntu. Tracker is a filesystem indexer, metadata storage system and search tool. A while back Tracker was causing high CPU spikes and increased memory usage for some users, but that has improved with Tracker v2. There was some discussion to install it by default with Ubuntu 18.04 LTS, but it was postponed, being considered that "such changes are risky in a LTS cycle". On my Ubuntu 18.10 desktop, I didn't notice any increased CPU or memory usage since I installed Tracker, except for the initial indexing, when there was a spike of increased CPU and disk I/O for a bit (there might have also been a spike after the first reboot, although I don't remember for sure). In case you encounter issues with it though, it's easy to remove it. 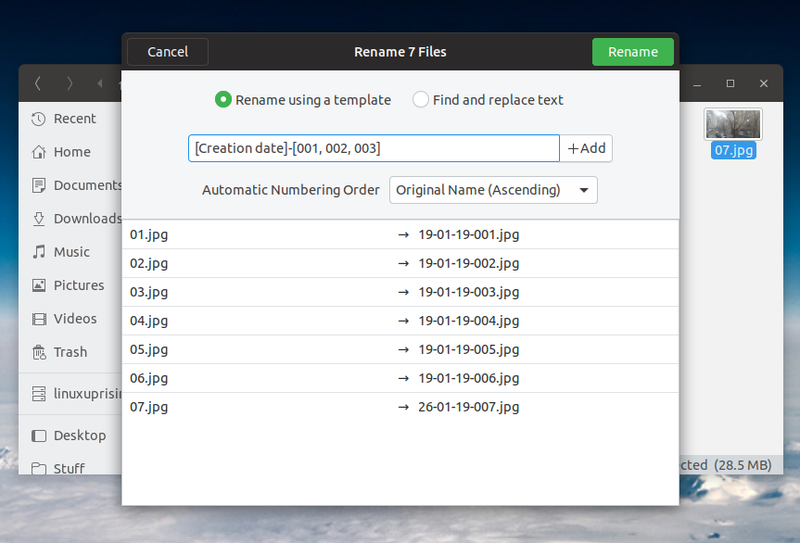 Being able to use metadata in the Nautilus mass file rename feature isn't the only thing Tracker brings. With Tracker installed, you can also search for files and folders from the Activities Overview, or search faster using the Files app (which also supports full-text search with Tracker). Now wait for Tracker to index your files. After your files are indexed, you'll be able to batch rename files using Nautilus (GNOME Files) with metadata support for tags like the creation date and camera model for images, and the artist name, title or track number for music.